Work on opening a major gateway to one of the region’s key regeneration sites gets under way this week. The £10m Middlehaven Dock Bridge and link road will create a major new access point that will kick-start the next phase of the town’s ambitious regeneration programme. Over the next 12 months the Middlesbrough Council-led project will see contractor Balfour Beatty replace the existing footbridge across Middlehaven Dock with a state-of-the-art road bridge. The new Dock Bridge is due to open next summer, paving the way for work to start on the proposed snow centre. The new road access will help to ease congestion on the A66 trunk route, as well as further opening up around 25 hectares of significant mixed-use commercial and residential development land on the wider Middlehaven site. The scheme has been designed and progressed by Middlesbrough Council over the last 18 months with a major injection of £3.9 million from Tees Valley Combined Authority. Councillor Charlie Rooney, Middlesbrough Deputy Mayor and Executive Member for City Centre Strategy, said: “This bridge represents a major milestone in the development of Middlehaven, and will further establish Middlesbrough as the city heart of the Tees Valley. “Completing the east-west riverside arterial route will help to ease congestion and boost public transport in what is one of the region’s most important regeneration areas. Tees Valley Mayor Ben Houchen said: “Tees Valley Combined Authority has made a significant contribution to this important project. “The new bridge will improve access to the Middlehaven area and support the regeneration and development of brownfield land sites, bringing investment and job creation opportunities to this part of Middlesbrough. The new road and lifting bridge – with associated lighting, drainage and landscaping works – will feature a 95-tonne steel bridge deck with 120 tonnes of steel reinforcement and 159 tonnes of pre-cast concrete units. The new highways will link Shepherdson Way with Scott’s Road, crossing a narrow channel connecting Middlehaven Dock to the River Tees. Community benefits during the project will include work experience, trainee and apprenticeship opportunities, engagement with local schools and colleges and adult employment opportunities. Balfour Beatty Operations Director Neil Beck said: “We are looking forward to renewing our working relationship with Middlesbrough Council to deliver the new Middlehaven Dock Bridge and road. Throughout the works, Balfour Beatty, Middlesbrough Football Club and the Council will work to ensure football fans, residents and businesses are kept informed of any disruption to pedestrian and road access. 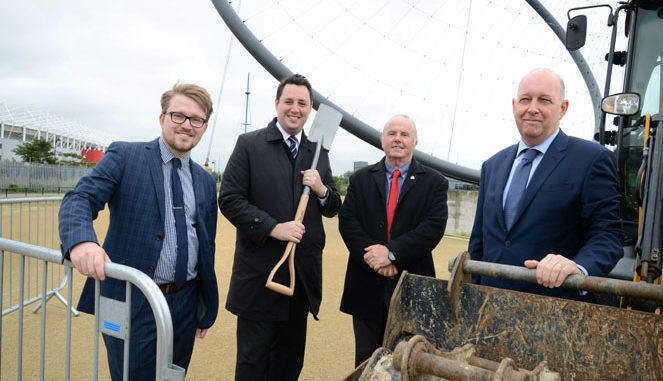 • Pictured above (left to right): Councillor Lewis Young, Executive Member for Economic Development and Infrastructure, Tees Valley Mayor Ben Houchen, Middlesbrough Deputy Mayor Charlie Rooney and Balfour Beatty Operations Director Neil Beck.